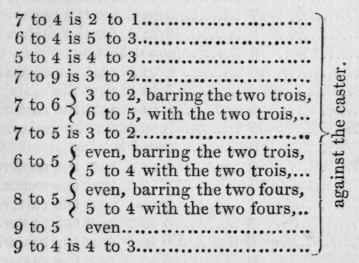 The nick of seven is 7 to 2, often laid 10 to 3. The nick of six and eight is 5 to 1. It is necessary to be perfectly master of these odds, in order to play the prudent game, and to make use of them by way of insuring bets in what is called hedging, in case the chance happens to be unlikely ; for by taking the odds, a ready cal­culator secures himself, and often stands part of his bet to a certainty. For example, if seven be the main, and four the chance, and he should have 51. depending on the main, by taking 67. to 3l he must either win 21. or 1l. ; and, on the contrary, if he should not like his chance, by laying the odds against himself, he must save in proportion to the bet he has made. The various ways of throwing all the different mains and chances are explained in the chapter on the Analysis of the Combinations of Two Dice.